Donald Trump‘s announcement that Washington will recognise Israeli sovereignty over the occupied Syrian Golan Heights is an effort to boost the re-election chances of Israeli Prime Minister Benjamin Netanyahu, analysts said. The US president’s comments, made on Twitter on Thursday afternoon, come only 19 days ahead of the Israeli elections. And with them, Trump has made it clear he wants to “shore up” support for Netanyahu, who is heading into the election on shaky ground, Khalil Jahshan, executive director of the Arab Center Washington DC, told MEE. “The message to people out there, in the region particularly, and worldwide: If you have military power, and you have US support, go ahead and occupy other people’s land by force,” Jahshan told MEE. Jahshan added that the US president’s statement serves as a distraction from both Trump’s and Netanyahu’s respective legal troubles at home. The Israeli leader is facing several corruption investigations and a looming indictment by the country’s attorney general, while US politicians are anticipating the release of special counsel Robert Mueller’s report on possible collusion between Trump’s election campaign team and Russia. Jahshan said the Golan statement also coincides with Netanyahu’s forthcoming visit to Washington, where the Israeli premier will meet Trump and take part at the AIPAC conference next week as a keynote speaker. Nihad Awad, the executive director of the Council on American Islamic Relations (CAIR), called Trump’s Golan tweet a clear attempt to intervene in Israeli politics and provide a boost to Netanyahu. “Trump is intervening in a foreign election on behalf of a politician who has aligned with racists, and who has passed segregationist nation-state laws in Israel,” Awad said of the Israeli prime minister. Israel approved a controversial nation-state law last year, which says that the country is “unique to the Jewish people”. Critics have condemned the legislation as racist, saying it enshrines discrimination against Israel’s Palestinian minority into law. Netanyahu cited the law last week to proclaim that Israel is for Jews only, “not a state of all its citizens”. Awad drew a link between Trump’s domestic policies against immigrants and Muslims, and Netanyahu’s foreign policy. Israel occupied Syria’s Golan Heights in the 1967 war and annexed the territory in 1981. It is now home to 34 settlements housing tens of thousands of Israelis. Ariel Gold, co-director of the feminist anti-war group CODEPINK, said Trump is solidifying his alliance with right-wing leaders around the world, including Netanyahu and Brazil’s Jair Bolsonaro. 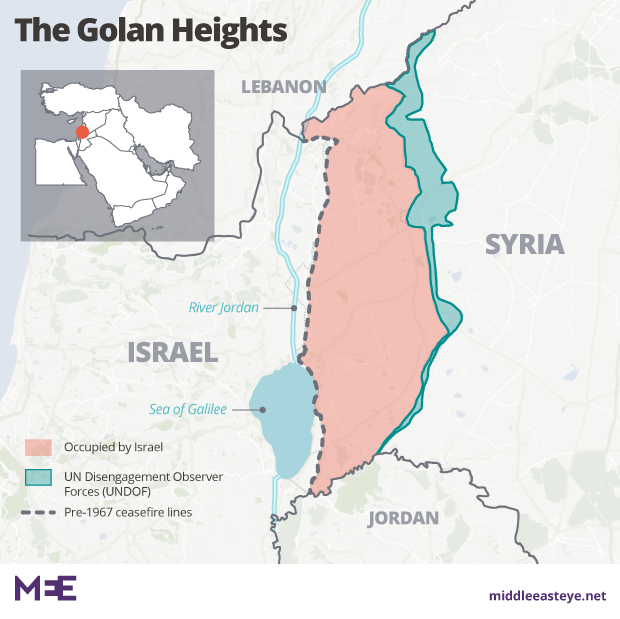 The Golan statement further isolates the US from a global consensus – Israel’s annexation of the Golan has never been recognised by the international community – while diminishing the prospects of peace in the Middle East. “This lets Israel know – like the embassy move did – that their government has the backing of the US, and so, with the backing of the world’s superpower, they don’t need to take into account as much what will help create peace,” Gold told MEE. That’s exactly what Netanyahu himself said on Thursday, as he hailed Trump’s statement recognising Israel’s hold on the Golan Heights. “The message that President Trump has given the world is that America stands by Israel,” he said in a statement. Trump’s announcement sparked fears that US recognition of Israeli sovereignty over the Golan may lead to Israel’s annexation of parts of the Palestinian West Bank, if not the entire territory, with US support. Omar Baddar, deputy director at the Arab American Institute, said Trump is marginalising the US role in the world by disregarding international law and pledging “full support for Israel’s illegitimate acquisition of territory by force”. 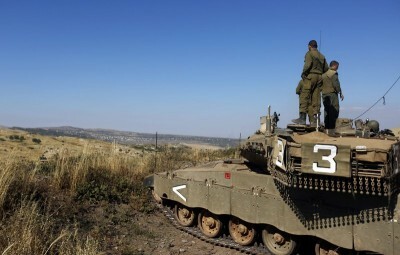 Both Trump and Netanyahu have stressed that Israel’s hold on the Golan must continue indefinitely to preserve the country’s security, pointing to the ongoing civil war in Syria and the presence of Iranian troops near the territory. “What is most insulting to everyone’s intelligence about Trump’s announcement is that it is framed as an effort to advance ‘security’ and ‘regional stability’, when the reality is that occupation is perhaps the biggest contributor to instability and violence,” he told MEE in an email. Indeed, Thursday’s tweet is the latest example of Trump showing a blatant disregard for international norms and institutions in favour of Israel. After his administration recognised Jerusalem as Israel’s capital against the objections of some of Washington’s closest allies, it also left the UN Human Rights Council in protest against its scrutiny of Israel’s policies. That was made all the clearer on Thursday, Jahshan said, as the president’s statement “makes a mockery of international law”.